Eight bodies were recovered from a crashed U.S. Marine helicopter in earthquake-ravaged Nepal, it was reported Friday night. Authorities had said earlier Friday, after the wreckage was found, that it was unlikely any of the six U.S. Marines and two Nepalese soldiers believed to have been aboard had survived. The helicopter, based at Camp Pendleton and attached to Marine Light Helicopter Squadron 469, disappeared over the town of Charikot on a steep Himalayan mountainside hours after a magnitude-7.3 earthquake struck the region earlier this week. Marine Lt. Gen. John Wissler, Commanding General, III Marine Expeditionary Force, Joint Task Force 505 and Marine Forces Japan, said during a news conference in Nepal that the wreckage of the UH-1Y Huey was found about 8 miles north of Charikot shortly before 2 p.m. Friday Nepal Standard Time in “exceptionally rugged terrain” in a dense forest at an altitude of about 11,000 feet. Wissler said he could not positively identify the cause of the crash nor could he confirm the identities of the service members, American or Nepalese, who were aboard the aircraft. The UH-1Y Huey was on a disaster-relief mission called “Operation Sahayogi Haat” when it was reported missing Tuesday morning, approximately nine hours after Nepal was struck by a magnitude-7.3 aftershock to the magnitude-7.8 temblor of April 25. The initial earthquake killed more than 8,200 people while the big aftershock claimed another 117 lives. The helicopter and squadron were diverted from a joint task force exercise in the Philippines to assist with search and rescue. “They were determined to go forward with their duties, eager to contribute to our mission and to alleviate suffering and to come to the rescue of those in need,” Wissler said. Aircraft from the United States, India and Nepal had searched for the missing helicopter before it was found. U.S. Army Maj. Dave Eastburn, spokesman for U.S. Pacific Command, said an assessment of the site was ongoing and a thorough investigation would be conducted. “They went to that remote land to help people who suffered devastating losses in a terrible earthquake,” Obama said. “They represent a truth that guides our work around the world — when our friends are in need, America helps. Adm. Samuel Locklear III, of the U.S. Pacific Command, said the men proudly served their countries as Nepalese soldiers and U.S. Marines. 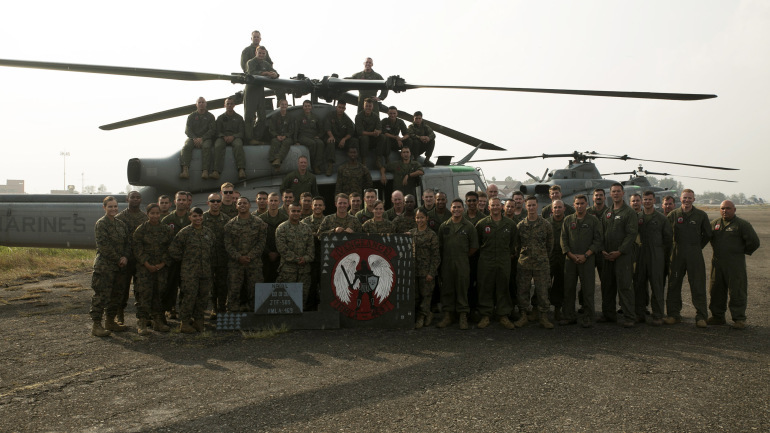 The Navy and Marine Corps will continue the relief mission in Nepal, Locklear said. This is a developing story. Check back with Times of San Diego for updates.